What would a well ventilated port city such as Honolulu, Hawaii, USA have for the concentrations (in parts per million) of CO2 or NOx, compared to a city like Linfen, China which is the site of a large coal industry? By how much would concentration change between different regions in the same city? That is, what range of concentrations are we looking at when it comes to NO2, for example? Feel free to post information on other gasses such as O3 and general pollutants. This question came from our site for scientists, academics, teachers, and students in the field of chemistry. As you can see from this graph, CO2 levels can vary quite a bit over time simply within one city. You can see a seasonal amplitude of +/- ~12 ppm that's due to plant photosynthesis speeding up (reducing CO2) in summer, and slowing down (allowing CO2 to increase) in winter. 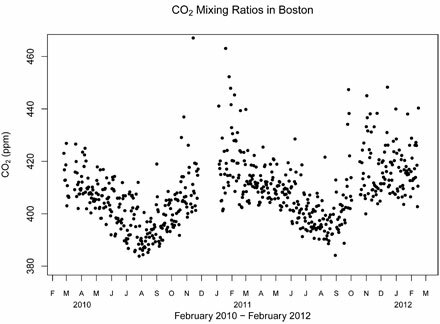 The CO2 concentration level in Boston is almost always several ppm higher than the global average, because cities, with their buildings and vehicles burning natural gas, gasoline, and oil, are relatively large sources of CO2. For example, in May 2011 the monthly average CO2 level at Mauna Loa was 394 ppm; at BU (Boston University), it was 405. 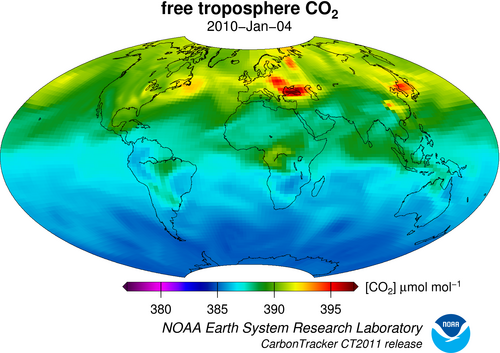 Here is a source with a collection of CO2 data from several different weather stations, including a couple in Hawaii. Because it's displaying CO2 1 to 5 km above the ground, it's going to smooth out the variations due to local forests, or power plants. But, you certainly can see areas of high CO2 concentration over eastern Europe / Black Sea (downwind from central Europe) and also China / Korea / Japan (downwind from China's industrial hubs). The US Environmental Protection Agency has a report on NOx here (see page 6 for a US "heat map" of local NOx concentrations). This University of Washington report also contains a global NOx map, for both surface and 5km altitudes (page 10). The Vulcan Project at the University of Arizona provides GHG emissions by geography and source. Not the answer you're looking for? Browse other questions tagged pollution greenhouse-gas-emissions or ask your own question.